We talked about properties and end behavior of graphs all year long. We started with linear, transitioned to piecewise through distance-time graphs, then absolute value, then exponential, then quadratic. These are the INB pages for our properties of quadratic graphs. Since we had talked about end behaviors, average rate of change, intercepts, vertices, positive/negative, etc. 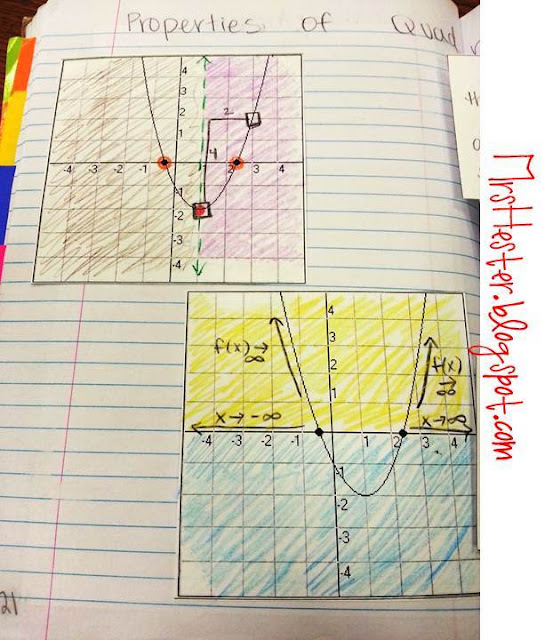 before, this was a quick extension of ideas to quadratics. Each student got two identical graphs. Two because all the color-coding info would be jumbled on one graph. 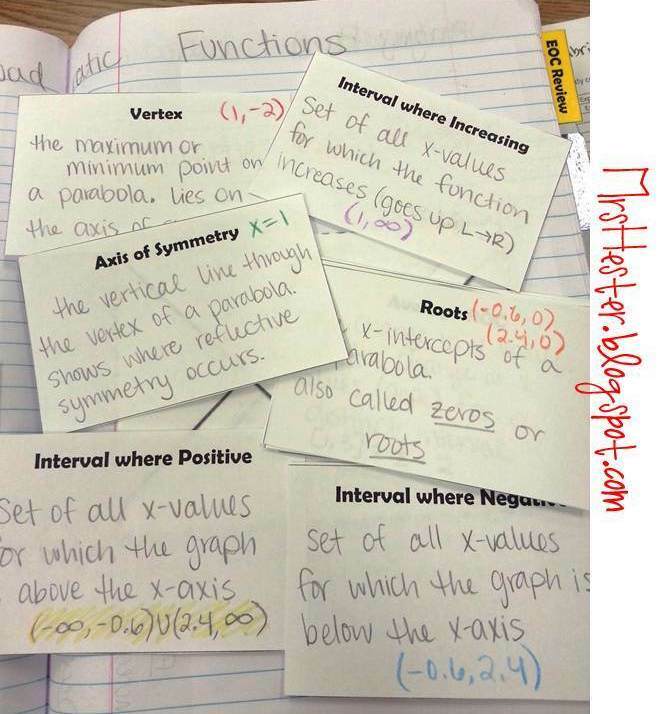 We color coded and created our flash cards all first, then taped everything into the notebook. When students walked into the classroom on this day, our "First Things First" section of the board told them to pick up two pages. One had graphs and the other is the flashcards and envelope. They also picked up scissors and immediately got to cutting everything out. This is something I often do, give students the directions before class officially starts. I begin on day 1 telling students that they are considered tardy to my class if they haven't begun the First Things First activity before the tardy bell rings. They learn this very quickly and don't waste time once they enter the classroom. I also promise them that I will give them a 2 minute warning at the end of class so they have time to pack up and clean up the classroom, and therefore leave when the ending bell rings. As students were cutting out their flash cards they were telling each other "hey, we know what these mean!" "I know this!" "Mrs. Hester, this looks easy!" I love when they are confident with their learning!! Once everything was cut out, I asked students where they wanted to start. They knew we had to talk about everything, but might as well let them choose the order! They would call our words that they felt confident in and provide a definition. Classmates would add to the definition and we would talk through specifics. Once I had guided the discussion to a place I was comfortable with, we wrote down the definition. We then switched to a colored pencil, marked that particular feature on a graph, and wrote the specific answer for that definition in the same color on the card. This provided students with a general definition, as well as a specific color-coded example. Using the flash cards in an envelope added an element of fun, as well as a way for students for study. They enjoyed pulling them out and quizzing each other. Got any ideas about how I could make this better? What are your thoughts about this lesson? Love this! I assist College Algebra students in one-on-one and small group situations. 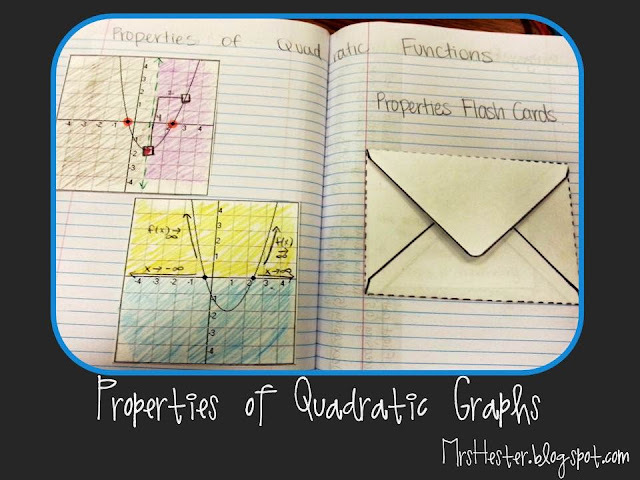 This will be a perfect way to tie a common thread through quadratic equations, graphing quadratic functions, and even quadratic inequalities. Hmmm...I think I feel a Quadratic Party in the works. Thanks for sharing!! Is there any way to have a look at these two files? The links are no longer active. I'm at mepckhm@gmail.com and I'm teaching this section using INB for the first time this year. I'd love some inspiration. I would love to get a copy of these two files also. My email is anelson@madison-schools.com. I will be teaching this concept the week after thanksgiving. thanks! I am going to hop on this bandwagon, too. I, too, would love to take a look at these files. Your notebook looks great! My email address is rishanabloom@hotmail.com. Thanks. I would love a copy of the two files. My email address is smilingbubbly@gmail.com. Thanks! Finally! A creative way to introduce/review vocab that is something other than simply copying terms on a page. Could I please get a copy of the two files? I would love to use this with my students! My email is drakeaellis1028@gmail.com.